The Iraqi army has captured 25 female ISIS members, 3 of whom are Turkish, during cleaning operations in Mosul. 25 female ISIS members have been captured in an underground tunnel during cleaning operations in the Mosul city recently cleared of ISIS. Iraqi security forces announced that of the captured female ISIS members, 3 are Turkish, 5 German, 3 Russian, 2 Canadian, one Chechen, and the rest Libyan and Syrian citizens. According to the Iraqi official Haidar al-Araji, arms and suicide belts have been found on the captured women prepared to attack Iraqi forces. An aerial video footage published by an official from the Iraqi Defense Ministry purportedly shows ISIS militants trying to escape Iraqi armed forces from western Mosul across the Tigris river and into the eastern side of the city. The video shows helicopters firing at what the Iraqi army says are ISIS militants who are swiming just meters away from the shores of the river. The footage was released by an Iraqi air force officer on Tuesday. Even though the Iraqi government declared Mosul liberated, there have been reported sporadic clashes between the remaining ISIS militants and Iraqi forces. Soldiers have been working to save civilians still trapped among the rubble of war in Iraq's second-largest city. Western Mosul is in ruins. From the tenth floor of a badly damaged hotel in Iraq's second-largest city, destroyed buildings and roads can be seen for miles on end. There is no building that has not been touched by fights and air attacks. The smell of decaying bodies fills the hot July air. Weapons, bullets, bodies and objects torn from everyday life are buried under the rubble. Soldiers have been working to rescue civilians still trapped inside. The women of Mosul are exhausted, and their babies are hungry. Barefoot and wounded, they walk for hours to reach safety. One elderly woman with a blood-stained face falls to the ground, crying "help me" to the Iraqi soldiers who are still searching for people in the rubble. She says she drank her own urine to stay alive while awaiting rescue. "We were locked in basements, women and children," she tells Al Jazeera. "We shouted, but no one could help us. No one rescued us for weeks. ISIL [Islamic State of Iraq and the Levant, also known as ISIS] fighters surrounded the houses with electric wires to blow up those who tried to escape." There are no men around in this area. Some who tried to leave the city were detained by Iraqi forces - some on suspicion of being affiliated with ISIL - while others died in the battle to retake Mosul. Iraqi soldier Usama el-Umani now guards the area around al-Nuri mosque, where ISIL leader Abu Bakr al-Baghdadi announced the creation of the group's "caliphate" in the summer of 2014. He pulls a mobile phone from his left pocket and says it belonged to a young ISIL member. On the phone, he scrolls through dozens of snapshots of everyday life in ISIL-controlled Mosul: In one, a woman brandishes an RPG and a Kalashnikov rifle in front of ISIL's black flag. "The defeat of the Islamic State in Mosul ends a battle, but not the war," Umani tells Al Jazeera. "Our concern is that the fall of Mosul could bring the organisation back to the beginning, to random and violent attacks, especially because sectarian divisions here are far from being resolved." "Defeating ISIL in Mosul does not mean that we have destroyed its roots, the deep reasons that generated it," she says. The streets around her house are full of rubble, and there is no water or electricity. She lives with her husband and their eight children; they had nine before ISIL entered the city. "They killed my son after ten days - hanged because he was the Iraqi police barber here in Mosul," Fasi says, pulling out her son's photograph from a drawer. "There is not a woman in Mosul who has not lost a beloved relative, a son, a husband, killed by those assassins," she says. "Every one of us weeps … in silence, not to bother the others." Sometimes, she adds, the local women meet in a house to share memories of their lost loved ones. "When the war arrived in our area … whole families were used as human shields [by ISIL]. Those who tried to escape were hanged." Outside her home are several water buckets; each day, she waits in line in front of a warehouse in western Mosul for her turn to fill them. Dozens of women stand for hours in the baking sun each day for water and food distribution from humanitarian agencies who truck it into Mosul. When they cry out in need, soldiers shout for silence. One woman shows her husband's identity papers, saying: "The army arrested him one month ago … They said he was an ISIL member, but he was a good man. I'm alone with four children, and I have nothing to eat." Her smallest son hides amid the folds of her black dress. "I see only despair around us," Fasi says. "I asked my children to forgive and to go on. I told my children that we will overcome this tragedy only by letting it go, but every day I find more anger in their eyes." Abudi Adwan, 11, today lives in eastern Mosul with his family, having fled from the western Wadi Ajar neighbourhood as fighting gripped the area. They have been sharing a small house with two other families, and Abudi has tried to be a breadwinner, as his own father cannot work after sustaining injuries from ISIL fighters who beat him when he refused to work for them. "Sometimes I go to a restaurant; the owner gives me 2,000 Iraqi dinars a day, but we can not even buy dinner with 200,000 dinars," Adwan tells Al Jazeera. Adwan's family had a shop in western Mosul, but it was destroyed. When they fled, they brought with them an orphan whose family was killed by an ISIL mortar. "He is traumatised," says Adwan's mother, Arwa. "He wakes up in the middle of the night, shouting, but we do not know what to do. We do not know how to help him, and we cannot even think of sending him to school because we cannot afford to pay for our children either." If the Iraqi government isn’t careful, the fall of ISIS in mosul may simply herald a transition to the next phase of conflict. I am currently in Iraq exploring the region in and around Mosul, assessing the current state of the city following Iraqi Prime Minister Haider al-Abadi’s declaration on July 9 that ISIS had been driven from Mosul. Last Thursday I interviewed a number of Mosul residents living in a camp for internally displaced persons (IDPs) outside of Erbil to get their views. What I discovered was a curious combination of hope, numbness and fear for the future. If the Iraqi government isn’t careful, the end of the war against ISIS in Mosul may simply herald a transition to the next phase of conflict. Just outside of the Kurdish city of Erbil sits Camp Baharka, set up by the Kurdistan Regional Government (KRG) to host IDPs from Mosul and environs. I met with camp manager Meva S. Akrey who shared a bit of the camp’s history and stories from current residents. The camp was established in 2014 as a temporary measure, but has since been upgraded to serve as a long term facility. Currently there are roughly 12,000 people living in the camp, with a total of 250,000 IDPs living throughout the KRG region. The camp is filled with a combination of Shia and Sunni Muslims, Christians, Yazidis, and other smaller religious subgroups. There has been no problem at the camp with the sectarian conflict or violence that has afflicted other parts of Iraq. Akrey said they have a formal training program that all new families must complete as soon as they arrive. “We emphasize how everyone has to live together, in tolerance. Life here is not about the political or religious issues of the past,” he continued, “but about how they’re going to live in the present and future.” For two years it has worked in the camp. Whether that tolerance remains in effect once IDPs return to their homes, however, remains to be seen. Akrey said the camp’s population was generally relieved that ISIS has been cleared from the city, but are discouraged by destruction wrought on the city and realization that most won’t be returning to home any time soon. Interestingly, for the most part, the people don’t blame anyone for their fate. It simply “is.” Whole sections of Mosul have been utterly destroyed in the process of freeing it from ISIS control. 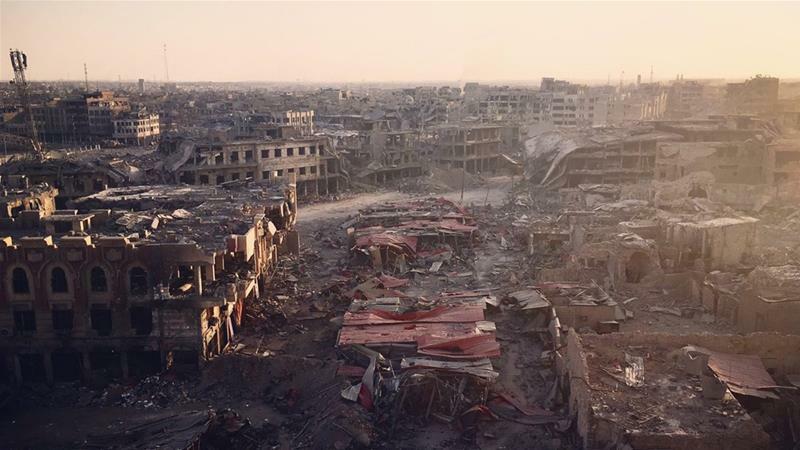 The destruction was caused by ISIS, the Iraqi Security Forces (ISF) as they cleared the city section by section, and coalition air attacks, artillery bombardment and drone strikes. Many have become numb and say it doesn’t matter who was responsible: they just want to rebuild and have a chance for a normal life. They do, however, have concerns about what comes next. Some of the displaced people at Camp Baharka don’t want to go back right away because they want to find out how Mosul is going to be administered first. “Many are afraid there will be a civil war,” Akrey admitted. “They are afraid that if Baghdad comes back in and rules like it did before (the perception of being unfair to the Sunnis, primarily), the people may fight against each other.” There is also the concern about conflicts that might arise between families who fled immediately and those who remained behind. One elderly camp resident (who wouldn’t give her name because she was still afraid that ISIS might find her) told me there was a commonly held belief that those who didn’t like ISIS left right away, while those that stayed behind did so because they supported ISIS. “I was able to leave,” she explained. “They could have left as well. Why do you think they stayed behind?” A man who lived several blocks over, however, had a different view. “Many people who escaped had money or cars or knew people outside who could help them. But many did not,” he explained. “Why accuse them of helping ISIS just because they weren’t able to leave?” These diverging views expose some of the dangers looming for post-ISIS Mosul—even aside from how the city is governed. “Many of the people in this camp who fled Mosul say they know who supported ISIS and who didn’t” in the areas where they lived, Akrey explained. “When they get back I am afraid many will carry out revenge attacks” against their neighbors in vigilante, extrajudicial ways. Shia firebrand cleric Moqtada al-Sadr said he has similar fears. “I’m afraid the defeat of Daesh [ISIS] is only the start of a new phase. I am very proud of Iraq’s diversity but my fear is that we may see a genocide of some ethnic or sectarian groups,” he told the Guardian during an interview at his home in Najaf. How Baghdad’s Shia-dominated government chooses to rule Mosul in the coming weeks and months will go a long way towards determining whether such genocides occur or not. Hossam al-Ayyar, a member of the Ninevah Provincial Council (which includes Mosul), said the reconstruction and governance plan “includes cultural and religious programs adopted by mosques, schools and churches to consolidate the values of coexistence and moderation, promote shared living and the culture of peace and freedom of belief and the respect of the rights of others.” If he is true to his word, it will be at least possible for Mosul to return to relative stability. Many Sunni leaders, I am told, remain unconvinced by such talk and want to see concrete actions taken. Perhaps the mood of Mosul’s residents was best captured by thirty-five-year-old Nadia Ali Asher, whom I interviewed on last Thursday in Camp Baharka. When ISIS rolled into Mosul in 2014, she immediately fled with her four young children. She became separated from her husband during the chaos and to this day still doesn’t know what became of him. I asked her what she hoped for the future for her children. The sudden change in her demeanor as she answered struck me. Her face conveyed an odd mixture of discouragement, anger and desperation. It was clear she desperately wanted to believe in a positive future for her children, but could only say “we don’t really have any hope. We just want a chance to live a normal life.” For her sake and the hundreds of thousands of others who will later return to Mosul, I hope al-Ayyar is true to his word. (Daniel L. Davis is a Senior Fellow for Defense Priorities and a former Lt. Col. in the U.S. Army who retired in 2015 after twenty-one years, including four combat deployments. Follow him @DanielLDavis1). German prosecutors are investigating whether a 16-year-old German girl is among a group of suspected members of so-called Islamic State held in Mosul. 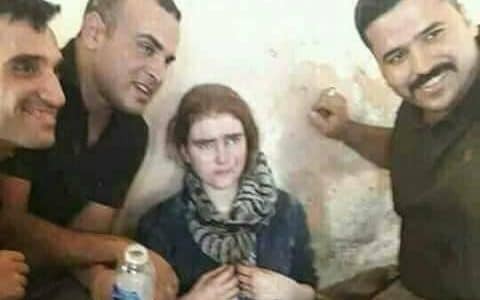 She was reportedly found by troops in a tunnel under the Iraqi city on Thursday along with 19 other foreigners. Officials are trying to confirm if she is the same girl who went missing from the German town of Pulsnitz last year. Iraq's government has declared victory over IS in Mosul, although clashes continue in parts of the Old City. The almost nine-month battle left large areas in ruins, killed thousands of civilians and displaced more than 920,000 others. Photographs of the girl being detained by Iraqi troops were published by local media over the weekend. The German DPA news agency reported that the group of foreigners were in possession of weapons and explosives belts when they were found. They included five Germans, three Russians, three Turks and two Canadians, it added. At first, the girl was thought to be Russian, according to the Kurdish BasNews website. A Yazidi family then thought she might be their missing daughter, but that was subsequently ruled out. On Monday night, the Bild newspaper said the girl was believed to be a 16 year old who had gone missing from her home in the German state of Saxony last summer. Shortly before travelling to Syria via Turkey, the girl had reportedly converted to Islam and been in contact with IS members online. She had been under investigation for allegedly preparing for a possible act of terrorism, but prosecutors suspended the probe following her disappearance. On Tuesday, the chief prosecutor in the German state of Saxony, Lorenz Haase, said officials were reviewing new evidence and that the investigation would resume if the girl "reappears and is conclusively identified". An Iraqi official told Reuters news agency he believed the girl was of Slavic origin, possibly Russian. She had been taken to a hospital for treatment for burns after being detained, and would probably be handed over to her country's diplomatic mission and not kept in Iraq, he added. The German BfV domestic intelligence agency estimates that 930 people, about 20% of them women, have left the country to join IS in Iraq and Syria. 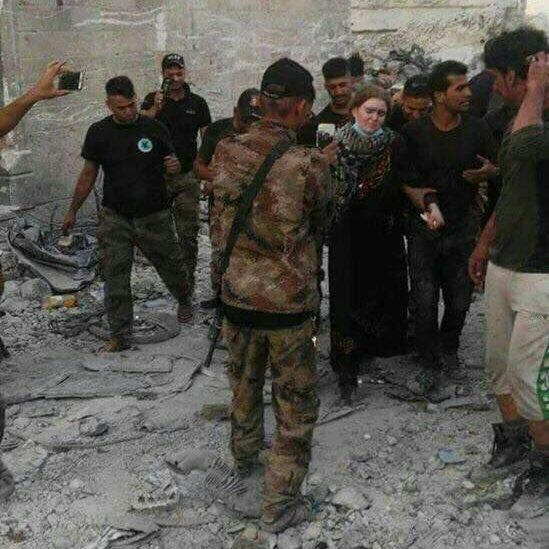 A 16-year-old German Islamic State bride, who reportedly joined the jihadist group after being radicalised online, has been captured by Iraqi forces in the ruins of Mosul. 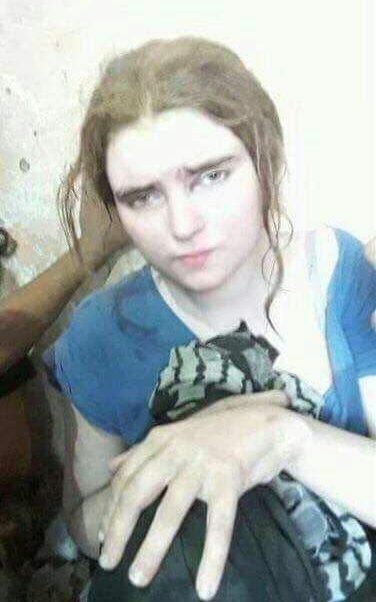 Linda Wenzel, from the small town of Pulsnitz, near Dresden, was discovered by troops with a group of 20 other suspected foreign female Isil members in a tunnel under the Old City on Thursday. Pictures shared on social media show the girl being escorted by security forces, appearing pale and unveiled but wearing a colourful scarf around her neck. She appears pale, afraid and covered in dust, unveiled but wearing a colourful scarf around her neck. 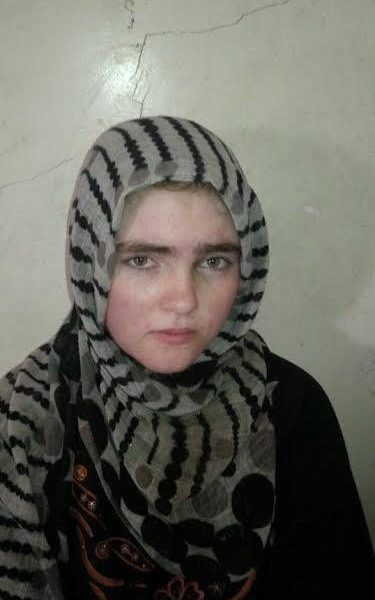 She was initially mistaken for a kidnapped Yazidi girl because of her lack of Arabic. Linda was reported missing from her home a year ago, where she had been living with her mother, Katharina, and step-father, Thomas. She grew up in a Protestant family, and had not showed any interest in religion until a few months before her disappearance. In the spring of 2016 she told her parents for the first time that she was interested in Islam. Friends in Pulsnitz say she converted to Islam around this time and was radicalised online in chat rooms. She started learning Arabic, taking the Koran to school, wearing conservative clothing and becoming fascinated with Islam before her disappearance. Police believe she had fallen in love with a Muslim man she met online who persuaded her to move to Syria to join him. She disappeared last July after telling her parents she wanted to stay the weekend at a friend's house. She travelled to Istanbul posing as her mother Katharina, and then down to Turkey’s border with Syria, where she crossed with the help of an Islamist group aligned with Isil. The jihadists then handed her over to an Isil fighter who is believed to have groomed her over the internet and convinced her to travel to the group’s so-called caliphate. Linda is thought to have made it to Mosul before the Iraqi army launched the offensive to retake the city in October. Until six months before she fled to join ISIS, she had never even travelled by train alone. "I am devastated by the fact that she was apparently completely brainwashed and persuaded to leave the country by someone and that she managed to hide it from me," Mrs Wenzel said last July. When she searched her room, Mrs Wenzel found an Islamic prayer mat and a tablet computer with a second Facebook account they did not know about on it. On this second account Linda was in touch with people in the Middle East and shared messages such as "Pray, the end is approaching". At the moment the priority is to determine whether this is Linda W or not. The police will undertake all necessary investigations,” Lorenz Haase, chief prosecutor and spokesman for the Dresden prosecutor's office, told the Telegraph. "If it is confirmed, we would reopen criminal proceedings against her which were set aside. We had set aside the proceedings on the grounds we did not know her whereabouts and she is a minor. She is understood to have been handed over to American troops stationed in Iraq for questioning. Four other German women were also reportedly discovered last week in a tunnel system built by ISIS. Iraqi forces say they discovered weapons and suicide belts at the site, presumably to be used for assaults on soldiers. They were part of a group of 20 female fighters, including Russian, Turkish, Canadian and Chechen, apprehended in the last remaining pocket of ISIS territory in Mosul. It is not clear whether Linda and the other women will be held in Iraq or deported back to Germany to face trial. A senior Iraqi judge told the Telegraph earlier this year that foreign members of ISIS would be tried in Iraqi courts, however as she is considered a minor they may decide to extradite her. Only a handful of European Isil members under 18 year of age have ever been detained, most of whom after voluntarily returning home. The Iraqi officer who oversees the make-shift jail facility said it currently holds some 370 prisoners. He says authorities were overwhelmed with detainees as Iraqi forces cleared the last neighborhoods of the city earlier this month at the end of a grueling nine-month campaign. More than 1,150 detainees have passed through the prison over the past three months, with 540 sent to Baghdad for further investigation, the officer said. Another 2,800 prisoners are being held in the Qayara air base south of Mosul, and hundreds more in a few smaller facilities. The officer spoke on condition of anonymity because he was not authorised to brief reporters. Prisoners who were discreetly interviewed by the AP insisted they were innocent. They spoke on condition of anonymity, fearing reprisals. He said he was a civil servant and had traveled between Baghdad and Mosul on several previous occasions before being detained. 'They said my name was in their database. I haven't seen any court or judge. I don't even know what I'm accused of. A lot of names are the same,' he said. The country's prime minister Haider al-Abadi has acknowledged Iraqi forces committed human rights violations, but insisted that these were 'individual acts' for which the perpetrators would be punished. ISIS militants were notorious for atrocities, both against civilians and Iraqi security forces, often hunting down anyone connected with the police or military after they overran territory. And for some Iraqi soldiers, the fight against ISIS in Mosul has been a slow, methodical quest for revenge. For three years, one lieutenant has hunted for two ISIS militants from his village who he believes killed his father. Along the way, he has shot to death detained militants after interrogating them, he acknowledges unapologetically. And if he catches either of the men he is searching for, the lieutenant vows he will inflict on him 'a slow death' and hang his body from a post in the village after forcing him to reveal where his father's body is buried. That sort of thirst for vengeance in the wake of military victories is fueling extrajudicial killings of suspected ISIS members at the hands of Iraqi security forces in and around Mosul. Videos that emerged last week showed troops in Mosul taking captured ISIS suspects and throwing them one by one off a high wall next to the Tigris River, then shooting their bodies below. Speaking to The Associated Press, four Iraqi officers from three different branches of the military and security forces openly admitted that their troops killed unarmed and captured ISIS suspects, and they defended the practice. They, like the lieutenant, spoke on condition of anonymity because they acknowledged such practices were against international law, but all those interviewed by AP said they believed the fight against ISIS should be exempt from such rules of war because militant rule in Iraq was so cruel. However, the killings risk tipping Iraq back into the cycles of violence that have plagued the country for over a decade, according to Belkis Wille, Iraq researcher with Human Rights Watch. ISIS was able to attract recruits in the past because of people's anger over abuses, including arbitrary detentions, torture and extrajudicial killings, she said. If abuses continue, 'all you're going to see is (that) young Sunni Arab men are going to want to join whatever the next extremist group looks like,' she said. Despite the military's vows not to tolerate it, she said no soldier or commander has been held accountable for any killings. The bloodshed reflects the deeply personal nature of the fight against ISIS. When the militants overran Mosul and large parts of northern and western Iraq in 2014, they specifically targeted members of the military and security forces and their families for brutal atrocities. Near Tirkrit, ISIS massacred some 1,700 captured military recruits and buried them in mass graves that have been uncovered since. Hundreds of policemen and soldiers in Mosul are believed to have been killed after the takeover. Militants made no attempt to hide atrocities. But a senior Iraqi officer said his troops regularly killed men who were said to be ISIS among civilians fleeing the city at screening centers in and around Mosul. He spoke on condition of anonymity because of the possibility it could prompt legal repercussions. 'When an entire group of civilians tells us, "This man is Daesh," yes, we shoot him,' he said, using the Arabic acronym for ISIS. The lieutenant said the two men who killed his father were well known in his hometown, a small village south of Mosul. He agreed to share his story with the AP because he wanted to show how personal the fight is for Iraqi troops. Two of his colleagues confirmed his version of events. The AP is not revealing the names of the men he is pursuing because there is no way to confirm independently they belonged to ISIS. The lieutenant said his father was an officer in the security forces who fought al-Qaeda, the predecessor to ISIS, in 2007, at the height of Iraq's sectarian violence. After ISIS seized the village in 2014, the tribes that were once kicked out for al-Qaeda ties moved back in, and ISIS installed them in security and administrative positions. According to the lieutenant, two men grabbed the lieutenant's father outside his home. The two were among those previously expelled for al-Qaeda ties, he said. The lieutenant was away, and his neighbors told him his father had been killed and who did it. He said he was told the men boasted about it in public. ISIS fighters also killed the lieutenant's uncle and more than a dozen other friends and relatives. The lieutenant keeps an old picture of the two men on his phone. He said a handful of other troops know about his hunt and have helped him interrogate and kill ISIS suspects. As Iraqi forces advanced toward the lieutenant's village last year in the lead-up to Mosul, he began interrogating captured ISIS suspects. He said he has killed more than 40 militants, whether in combat or in interrogations on the sidelines of the battle. He acknowledged most were not directly responsible for his relatives' deaths. 'I'm not selfish with my revenge, what I'm doing is for all Iraqis,' he said. Early on in the Mosul operation, he said he learned that one of the two men was in Tal Afar, a town west of Mosul that remains in ISIS hands, or had fled to Syria. In early July, as Iraqi forces pushed into Mosul's Old City, he received a tip on the location of the second man. He said a colleague, an intelligence officer, called and said he was holding an ISIS suspect from the lieutenant's home town. 'I told him don't do anything, keep him there. I'm on my way,' the lieutenant said. The detainee was the uncle of the lieutenant's second target. The man was left alone with the lieutenant in a bare concrete room without a table or chair. 'I didn't torture him. I cut the plastic handcuffs from his wrists and gave him water,' the lieutenant said. The man was elderly, with a grey beard and hair. Eventually, the man told the lieutenant that his second target was alive and in Mosul's Old City. 'After I questioned him I sent him to hell,' the lieutenant said flatly. He said he shot the man with his side arm and left his body on the floor. The first reports of revenge killings appeared within weeks of the launch of the Mosul operation last year and continued throughout. But the government and rights groups do not have an exact number. 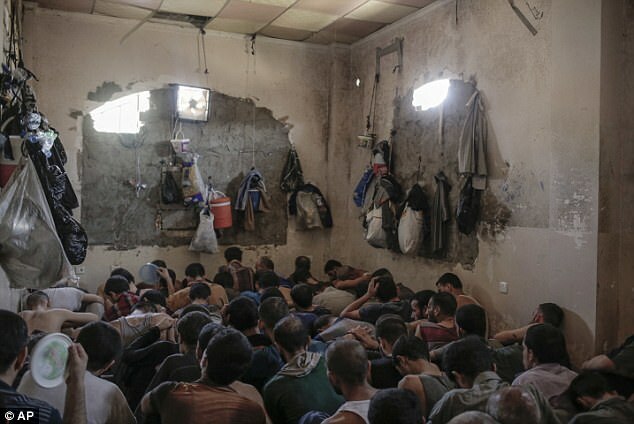 In June, Human Rights Watch said at least 26 bodies of blindfolded and handcuffed men had been found dumped in government-held areas in and around Mosul. A month later, HRW said it had further reports of extrajudicial killings. Wille of Human Rights Watch said it was taking place 'basically everywhere that is touched by this conflict' and by every armed force involved in the fight. The military says troops have orders to hand any captured ISIS over for interrogation ahead of future trial. He pledged the government would punish the perpetrators. The lieutenant dismissed the idea of going to the courts, saying they are corrupt and suspects could bribe their way to freedom. When al-Abadi declared 'total victory' in Mosul last week, the lieutenant said he believed his target is still in one of the last ISIS pockets in the Old City. 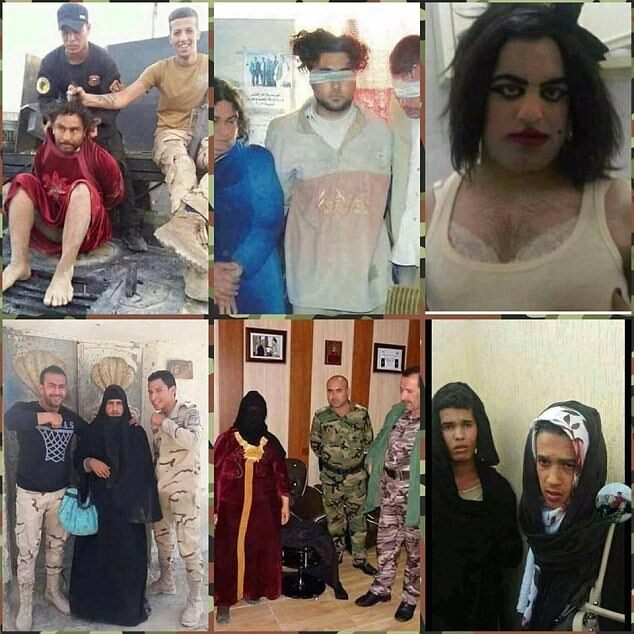 ISIS fighters dress up as WOMEN with make-up and padded bras in desperate bid to flee Mosul - but are caught after neglecting to trim their facial hair! A Jihadist attempted to flee Mosul in a disguise similar to a pantomime dame, but was caught when he forgot to shave off his beard and moustache. The ISIS fighter was trying to get away from the former militant stronghold as the city was recaptured, but didn't quite get his escape plan right. Dressed in women's clothes and with elaborate make-up, the bearded man forgot to get rid of his facial hair. 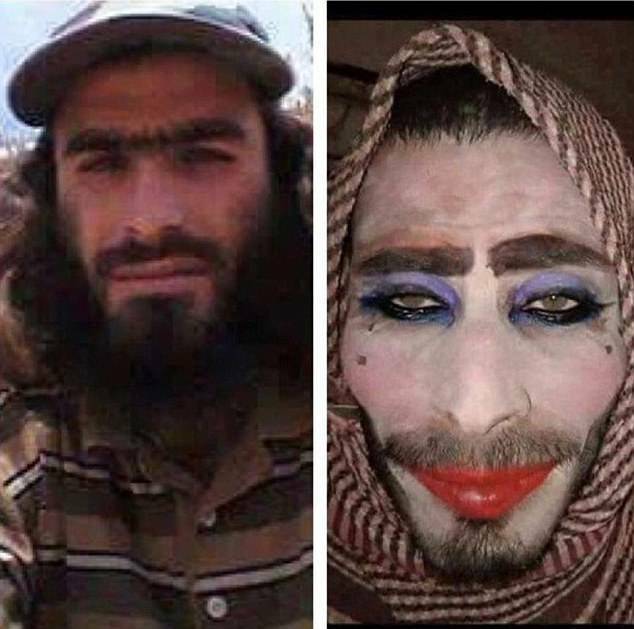 In photos released by the Iraqi army after his capture, the man can be seen to have slathered on powder, eyeshadow and lipstick, even adding some beauty spots. But the large moustache and beard as well as full eyebrows, rather give the game away. Other photos released by the army show the men in padded bras as they try to slip through the net and out of the city. Mosul's Old City, which once stood as a neighborhood of densely built alleyways and homes on winding lanes, has been reduced to rubble by a months-long war to root out the Islamic State. The effect of the battle, which ended as jihadists made their last attempt to hold on to the region earlier this month, can be seen in stark before-and after satellite photographs. Much of the city has been leveled, with rubble and dust covering what was once a thriving neighborhood in Iraq. Nearly a third of the Old City - more than 5,000 buildings - was damaged or destroyed in the final three weeks of bombardment up to July 8, according to a survey by UN Habitat using satellite imagery. Across the city, 10,000 buildings were damaged over the course of the war, the large majority in western Mosul, the scene of the most intense artillery, airstrikes and fighting during the past five months. The survey only covers damage visible in satellite photos, meaning the real number is likely higher. It took Iraq's US-backed forces nearly nine months to wrest Mosul from the Islamic State group, and the cost was enormous destruction, especially in the western part of the city. Mosul was finally liberated on July 10. Residents of the city have been left rebuilding their lives from the rubble left from multiple bombings as they use a temporary bridge to get over the Tigris river. Many people from West Mosul, where whole neighbourhoods were flattened in air and artillery strikes by a U.S-.led coalition, are struggling to pay rent in temporary accommodation. Often they have no work and are running out of funds. Safwan al-Habar, 48, who has a house in al-Zinjili district, had spent a morning seeking help for a particularly alarming problem - Islamic State had booby-trapped his house. 'Two bombs attached to each other with wire. If you put your leg on it, it will explode,' he said. Another man, Mirsur Dannon Hassan, 53, said his house had been destroyed in an air strike. 'I don't have a salary. I need help to rebuild it,' he said. He was living in rented accommodation with his wife, five daughters and son in the east but the landlord had just increased the rent from £77 ($100) per month to £154 ($200). They said life was miserable under Islamic State, also known as Dash, which seized Mosul in July 2014 and declared it the capital of a self-styled caliphate spanning parts of Iraq and Syria. There were beatings and executions for transgressions. As the fighting worsened, gunmen opened fire on people trying to escape. The reality of living in Mosul comes as Pentagon chief Jim Mattis said on Friday that he believes Islamic State chief Abu Bakr al-Baghdadi is still alive, following various claims he was dead. He said: 'I think Baghdadi's alive... and I'll believe otherwise when we know we've killed him. There have been persistent rumors that Baghdadi has died in recent months. The Britain-based Syrian Observatory for Human Rights, a longtime conflict monitor, last week said it had heard from senior IS leaders in Syria's Deir Ezzor province that Baghdadi was dead. Russia's army said in mid-June that it was seeking to verify whether it had killed the IS chief in a May air strike in Syria. With a $25 million US bounty on his head, Baghdadi has kept a low profile but was rumored to move regularly throughout IS-held territory in Iraq and Syria. The Iraqi native has not been seen since making his only known public appearance as 'caliph' in 2014 at the Grand Mosque of Al-Nuri in Mosul, which was destroyed in the battle for Iraq's second city. "They make a desert, and call it peace," concluded a bitter enemy of the Romans in a famous ancient speech. His repudiation of empire and war might seem familiar among the cities of Iraq and Syria today: In Mosul, the Iraqi city recently retaken from the Islamic State, victory was declared amid a sprawl of devastation — thought it's unclear how long the fragile peace may hold. Part of the damage is the direct result of the militant group's tactics. They desecrated numerous ancient sites in and around the city that, in their puritanical version of Islam, they viewed to be heretical. They hid behind civilians — and in civilian institutions like schools and hospitals — as airstrikes pummeled their positions. And they deployed myriad booby traps and suicide car bombs in their grim defense against the combined efforts of Iraqi government troops, Kurdish forces and other allied militias. "When I look around the world, in some ways there’s nothing like Mosul that we’ve encountered," a State Department official told my colleagues last week, describing the scale of the challenge ahead. "The level of contamination, though, is not one of those where we’re talking weeks and months. We’re talking years and maybe decades." You remember. It was supposed to be 21st-century war, American-style: precise beyond imagining; smart bombs; drones capable of taking out a carefully identified and tracked human being just about anywhere on Earth; special-operations raids so pinpoint-accurate that they would represent a triumph of modern military science. Everything “networked.” It was to be a glorious dream of limited destruction combined with unlimited power and success. In reality, it would prove to be a nightmare of the first order. If you want a single word to summarize American war-making in this last decade and a half, I would suggest rubble. It’s been a painfully apt term since September 11, 2001. In addition, to catch the essence of such war in this century, two new words might be useful: rubblize and rubblization. Let me explain what I mean. In recent weeks, another major city in Iraq has officially been “liberated” (almost) from the militants of the Islamic State. However, the results of the US-backed Iraqi military campaign to retake Mosul, that country’s second largest city, don’t fit any ordinary definition of triumph or victory. It began in October 2016 and, at nine months and counting, has been longer than the World War II battle of Stalingrad. 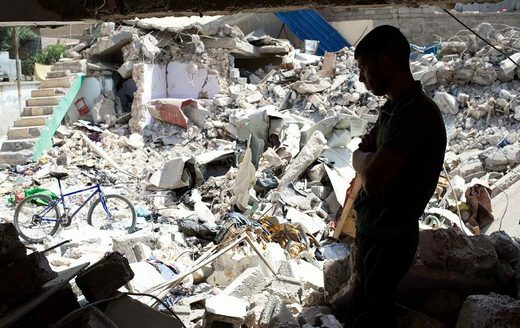 Week after week, in street to street fighting, with US airstrikes repeatedly called in on neighborhoods still filled with terrified Mosulites, unknown but potentially staggering numbers of civilians have died. More than a million people—yes, you read that figure correctly—were uprooted from their homes and major portions of the Western half of the city they fled, including its ancient historic sections, have been turned into rubble. For the past seven months, Abu Hassan, an army medic, has treated the damaged and desperate people of the Iraqi city of Mosul as they arrived from the cauldron of war. Soldiers, women and children often trembled in fear in front of him, hours after escaping the bloody clashes, as Iraqi forces battled to wrest control of the city from Islamic State fighters. But not nine-year-old Mohammed. “I was shocked,” said Hassan. “It’s not a normal thing for a child to say. I asked him: ‘What did your dad do?’ He said he was a sniper emir – the emir of snipers. Since the recapture of Iraq’s second city earlier this month, the toll the terror group’s occupation took on the city’s residents – and especially its young – has begun to emerge. Hundreds, potentially thousands, of children have been left orphaned by war. Some bear a second burden – an ideology that has stripped them of innocence. To many in their own society, they are the devil’s spawn; stateless outcasts, unworthy of basic care. Aid agencies and state welfare systems do not want to acknowledge them. The children of Isis are hidden away in aid camps across northern Iraq, in private homes in the liberated east of Mosul and in the Kurdish north, where family members, volunteer workers and a small number of underprepared and poorly funded officials are offering whatever support they can muster. One makeshift programme is run by Sukaina Mohamed Younes, the head of the Office of Women and Children in Nineveh province. Sukaina received Mohammed from the Iraqi army medic and reunited him with an uncle in Erbil – away from Mosul locals with revenge on their mind. She said the scale of social problems facing families in post-Isis areas was overwhelming. “We have received from Mosul [tens of thousands] of children who lost their mother and father,” she said. “You can say [75%] are from Isis families. We do not have an exact number, because some children don’t have any ID, so we don’t know who they are. I can tell you that 600 Isis orphans are in Hammam al-Alil [refugee camp]. Adding to this is the near total absence of psychological or psychiatric services in Iraq and an unwillingness to embrace therapy programmes that could treat the myriad traumas of war. In Erbil, Mohammed – whose name the Guardian has changed to protect his identity – said he was in a basement with seven men, all Isis members, the day he was rescued. He spoke with matter-of-fact calm about life in west Mosul, one of the world’s most lethal neighbourhoods, and the last holdout of the terror group in the city before it was overrun this month. Mohammed’s carers believe both his parents were killed in the last days of the fight, and that both were ideologues who were instrumental in his indoctrination. In between describing scenes of extreme violence and fighting in an Isis children’s unit (Fetiyen al Jinneh), Mohammed also spoke of his father taking him to the playground and buying him a bicycle, and fighting with boys at school. Since speaking with the Guardian, Mohammed’s uncle has been keeping him away from other Mosul residents, particularly those who may have lived in his neighbourhood. In the chaotic aftermath of the war and the combustible atmosphere surrounding those who were part of the Isis milieu, in one way or another, there is little hope of any state support, or reconciliation. Belkis Wille, senior Iraq researcher at Human Rights Watch, said the children of Isis were treated as adults by the state judiciary. In the camps of northern Iraq, mothers who have borne children of slain Isis fighters, many of whom were foreigners, are doing their best to hide their histories. To avoid being targeted by prejudice or even worse, they frequently claim their children are nieces or nephews. If their affiliations were made public, the best they could hope for in the current climate would be being exiled for a second time. With reconciliation out of reach, for now, Sukaina believes rehabilitation is still possible for some of Mosul’s young people. Disavowing beliefs that were ingrained through dogma and trauma is a necessary first step, which could at least be started through community support, she said. “I believe that between the ages of eight and 12 it is easy to help them return to normal. Teenagers are really difficult because they have a stronger ideology. US-trained Iraqi army unit allegedly executed dozens of men in the final phase of the battle against ISIS fighters in Mosul’s Old City, Human Rights Watch has claimed. ISIS occupation of Mosul, once Iraq’s second largest city, has virtually come to an end. Though small-scale fighting continues, and US military strikes continued through at least July 17, ISIS control over the city has largely collapsed. Many among the ISIS forces were killed, many fled and many have probably melted back into local communities. US, Iraqi, and some other governments and media are celebrating the defeat of ISIS as the liberation of the city. Certainly there is a great relief for the hundreds of thousands of residents who were driven out of their homes or who survived years of ISIS brutality, extremism, and destitution. Certainly the end of ISIS control of its largest Iraqi population centre is important in the struggle to reduce and eventually end the financing, military power and global appeal of the terrorist organisation. The same is true of the likely military defeat of ISIS in Raqqa, its Syrian centre and “capital” of its so-called caliphate. The price paid by the people of Mosul is incomprehensibly high. Thousands of innocent civilians have been killed – no one knows exactly how many people have died, how many bodies remain crushed under the rubble of the once-vibrant city, how many whole families have been lost, how many children have been orphaned. A million or so were displaced from their homes; hundreds of thousands of weakened, malnourished Moslawis, many of them psychologically devastated from years under ISIS rule, are still languishing in ill-equipped camps in the desert outside the city, where temperatures routinely soar to 120 degrees. No one can be sure yet of which military forces fighting in and around Mosul were responsible for exactly which civilian deaths. Certainly ISIS killed many people – directly and indirectly. There is little question, however, that the United States caused a major share of the carnage. On May 19 the Trump administration announced that its new tactic in both Mosul and Raqqa would be to surround and “annihilate” ISIS; this translated, as expected, into a cascading escalation of violence against the trapped civilian populations. Their assessment was likely based on the perceived threat those foreign fighters might pose to Americans as well as Europeans – while lacking any real concern about Iraqis. The Pentagon claims it has been responsible only for a total of 603 “accidental” civilian deaths since the entire anti-ISIS air war began back in 2014. But Airwars, a British-based organisation that tracks civilian deaths from the air war in both Iraq and Syria, estimates that US coalition airstrikes killed 529 to 744 civilians in June alone – about 52% more than in the month before. The infrastructure of the city, especially on the western side, is in ruins. The United Nations estimates it will cost over $1 billion just to stabilise Mosul with the most basic levels of repair to the electricity, water, and sanitation infrastructure and beginning to reopen schools and hospitals. Full rebuilding of the city will take billions more. Destroying the village – or in this case the city – will certainly not end terrorism, nor will it mean the end of ISIS. Despite – and at least partly because of – Washington’s almost 16 years of war against terror, terrorism is doing just fine. Military force doesn’t work against terrorism. In the last several years, ISIS expanded from a vicious terrorist organisation to include a conventional military force capable of seizing and holding territory and people. It’s that latter component that the current US-led military coalition is able to challenge, and certainly diminishing or ending that conventional military capacity is important. It is primarily important for the hundreds of thousands of people forced to live under the extremist violence of ISIS, and the loss of a land-based caliphate will undermine at least some of ISIS’ ability to attract and recruit international supporters. For ISIS, the symbolism of losing Mosul also means the loss of the site where ISIS leader Abu Bakr al-Baghdadi first announced the creation of their so-called caliphate in 2014. Mosul’s historic al-Nuri Mosque lies in rubble. But that’s a far cry from ending ISIS itself, let alone ending terrorism. Because the range of strategies that have at least some chance of defeating terrorism – all of which are medium- to long-term, all of which involve political, diplomatic, humanitarian, economic, and other approaches, and all of which require rejecting military options – are still marginalised, de-prioritised and under-funded. The rebuilding of the shattered city is going to take a lot more than money. With around half the population still displaced, residents who barely survived the years of ISIS control and the months of fighting and airstrikes will need support for years to come. Many are injured or ill and will need extensive medical care, and many children are malnourished. Many kids have been without school for long periods, and many others have grown up in ISIS-run schools shaped by militaristic, violent propaganda. Post-traumatic stress is almost certainly endemic throughout the population. Beyond the physical and psychological damage, rebuilding any level of social cohesion remains an enormous challenge. The destruction of the city means that production, commerce, and jobs are gone for an indefinite period, and there are no means of livelihood. There are divisions among survivors, with anger toward those perceived to have collaborated with ISIS reportedly leading to violence. The costs will be enormous – and it remains uncertain where even a small part of that funding will come from. That pattern showed up powerfully across Iraq following the invasion and occupation of the country, which itself followed the bombing of critical infrastructure already weakened by a dozen years of crippling economic sanctions. For years, electricity beyond a couple of hours a day, and access to clean water, remained out of reach for most Iraqis. For many, those deprivations remain today. The pattern is already repeating itself in Mosul. The Trump administration’s rejection of “nation building” extends far beyond a needed critique of past interventions. Instead, Trump’s definition seems to imply an absolute refusal to provide any support for any of the people, cities, countries devastated by US wars. US funding for UN humanitarian agencies may be reduced to historic low levels. And the capacity and willingness of the US-backed Iraqi government to provide for the rebuilding of Mosul, let alone for the whole range of war-ravaged towns and cities across the country, remains in question. For now, the Iraqi government is celebrating the end of ISIS control of Mosul. But it remains the same Shi’a-dominated sectarian government that in the years since the US invasion and occupation began in 2003 has discriminated against and seriously oppressed Iraq’s large Sunni minority. This discrimination has diminished somewhat since the election of Haider al-Abadi, the current Iraqi prime minister, in 2014, but it remains a continuing problem. Shi’a sectarianism was one of the factors that led to the view among numerous Sunni Iraqis that as bad as ISIS was, it was somehow a lesser evil than the existing government. Moreover, it’s clear that at least some powerful figures in Iraq still harbor suspicions of Mosul’s people. The people here have always had a rebellious nature, so they should take some responsibility for what has happened,” said Maj. Imad Hassan, a federal police officer from Baghdad. … “I hope this destruction teaches them their lesson,” he said. That doesn’t bode well for Mosul being able to rely on support from the Iraqi government and military to protect and rebuild their city. The question of how and by whom Mosul will be governed also remains uncertain. The US-backed Shi’a-dominated Iraqi military now claiming credit for defeating ISIS are the same military forces who dropped their weapons and fled, leaving the largely Sunni civilian population of Mosul to face the violence of ISIS – and undoubtedly many Mosul residents still feel betrayed. Although not as dominant as the role of the Syrian Kurdish YPG fighters in Raqqa, the Iraqi Kurdish peshmerga forces from the semi-autonomous Iraqi Kurdistan played a major role in the military attack on Mosul over the last year. The Iraqi national government and the Kurdish regional authorities have already clashed over the question of the post-ISIS governance of Mosul, with Kurdish leaders hinting they might try to absorb the overwhelmingly Arab city into the Kurdish region. While Mosul is in northern Iraq, it has never been part of the recognized Kurdish region. But the fighting of recent years has upended many earlier assumptions. What is required, but not yet on any official agenda, is the need to entirely re-think and reject the notion of “military solutions to terrorism.” There simply isn’t one. A real solution to terrorism – not a fake military answer – requires something very different. And it won’t happen fast. What does that look like? It means creating a real negotiating process aimed at diplomatic rather than military solutions. It means pressuring US allies Saudi Arabia, the UAE, Qatar, and others to stop arming and financing ISIS and other extremist fighters directly or indirectly. It means pressuring the Iraqi government – by threatening to withhold the US money, arms, training, and diplomatic support it relies on to remain in power – to end its legacy of sectarianism. And to press other US allies – including the Iraqi Kurdish regional government and others – toward negotiations rather than proxy wars in Iraq. It means beginning a conversation, even if the reality is far in the future, about the need for a real arms embargo on all sides. And it means a massive investment – of high-level attention, diplomatic expertise and, yes, huge amounts of money through the United Nations – into responding to the humanitarian disaster that is today’s Mosul. Hiyam Mohammed hid in her home with her family on the edge of the Old City throughout the fight. They could see the cemetery from their house. She said the only way to justice is if the [Iraqi] government and [US] coalition pay compensation to those who lost relatives or property. Phyllis Bennis directs the New Internationalism Project at the Institute for Policy Studies. She’s the author of Understanding ISIS and the New Global War on Terror: A Primer. In the wake of victory against the Islamic State group in Mosul, Iraq’s political, religious and military leaders are debating the future of the country’s powerful Shiite militias — the tens of thousands of men who answered a religious call to arms three years ago and played a critical role in beating back the extremists. Some are demanding the mostly Iranian-backed forces be disbanded but the militias say their sacrifices on the battlefield and the fact they were sanctioned by Iraqi Prime Minister Haider al-Abadi have earned them a permanent place in the hierarchy of Iraq’s security forces. The Shiite militias stepped into a vacuum when the Iraqi army largely dissolved after IS overran Mosul and pushed within 80 miles of the Iraqi capital. Shiite Sheikh Fadil al-Bidayri was among the clerics at an emergency meeting in the holy city of Najaf in June 2014, when Iraq’s Shiite religious elite — led by the country’s top Shiite cleric, Ayatollah Ali al-Sistani — issued a call to arms as a last-ditch effort to protect Baghdad. Tens of thousands of men, many of them members of the long-established Shiite militias with close ties to Iran, answered al-Sistani. In the days that followed, Iraq was flooded with training, money and weapons from Tehran. Billboards praising the groups — depicting Iraqi and Iranian paramilitary leaders side by side — popped up across Baghdad, alongside posters of martyrs honoring the fallen. The government-sanctioned groups became known as the Popular Mobilization Forces, known as Hashed al-Shaabi in Arabic. Although the Shiite militias did not play a central role in the battle for the city of Mosul itself, they moved into the deserts held by IS west of the city, massing around the town of Tal Afar and taking a border crossing between Iraq and Syria. They also took control of highways bisecting the Sunni heartland in western Iraq and used as vital military and civilian supply lines. In past fights against IS, including the operation to retake for the cities of Tikrit and Fallujah, the Shiite militias were accused of sectarian killings and other abuses against minority Sunnis. They acknowledge some abuses may have occurred but say those responsible have been disciplined. Over the past three years, as the military fight against IS in Iraq pushed the extremists back, Iran’s influence in the country grew. “We always knew that Iran would use this (call to arms) to increase its own power in Iraq, but we had no other choice,” said al-Bidayri, recounting the meeting in Najaf and the panic-filled days after the 2014 fall of Mosul. Al-Bidayri says now that Mosul has been retaken and the Iraqi military has been partially rebuilt, he believes the Shiite militias should be disbanded, to curb Iranian influence in Iraq and reduce sectarian tensions. The elderly sheikh, like much of Iraq’s religious establishment in Najaf, is a staunch nationalist and wary of Iran’s growing influence. Iraq’s influential Shiite cleric Muqtada al-Sadr also called for the militias to disband during a March anti-government rally that saw thousands of his supporters fill the streets of Baghdad. According to the 2017 Iraqi budget, the government-sanctioned Popular Mobilization Forces now number about 122,000 fighters. The umbrella is dominated by Shiite militias but also includes Sunni and Christian groups. “The Hashed (Shiite militias) will remain and our relationship with Iran will remain,” said Hadi al-Amiri, a senior leader of the Badr Brigade, one of Iraq’s most powerful Shiite militias. Al-Amiri said IS’ insurgent capabilities will pose a long-term security threat to Iraq after the military fight against the group is concluded. As the conventional fight against IS winds down, it’s unlikely Iraq’s existing security forces will be able to absorb all the militia factions. “If you add up all of the demands from all the different factions and militia leaders, and then you look at how much actual power and money Iraq has to distribute to them, their claims are like 250 percent of whatever pie there is to be divided,” said Nathaniel Rabkin, managing editor of Inside Iraqi Politics, a political risk assessment newsletter. On the outskirts of Najaf, graves of militiamen who died battling IS have swelled among the plots in Wadi al-Salam, the well-known Shiite graveyard that is also the world’s largest. Garlands of plastic flowers adorn headstones bearing the crests of the most powerful militia groups: the Badr Brigades, Saraya Salam and Kataib Hezbollah. Abdullah Abbas, a thin 18-year-old from Najaf, guarded a plot of graves of Katib Imam Ali fighters, a small militia closely tied to Iran and active both in Iraq and Syria. In 2013, he left school at age 14, to become a fighter. The militia at the time mainly fought in Syria where it propped up President Bashar Assad’s government. Since then, he has bounced between Syria and Iraq. Abbas said that if the government decides to dissolve the Shiite militias, he could easily find better paying work as a laborer. But he admitted he couldn’t imagine life without the purpose and prestige of being a militia fighter. The brutal fight to rid Mosul of so-called Islamic State has left the northern Iraqi city in ruins, thousands dead and survivors scattered far and wide. Just how much devastation was caused by the battle between Iraq’s forces - backed by US-led air strikes - and the militant group, and what will happen now? While the battle for Mosul is over after nine months of fighting, its people are facing a humanitarian crisis on a catastrophic scale. Death toll estimates vary widely, from thousands to tens of thousands, and more than one million - equivalent to the population of Dublin - have fled their homes since the offensive started in October last year. Whole neighbourhoods have been flattened, bodies remain under rubble and streets are littered with unexploded weapons, landmines and booby-traps. Much of Iraq’s second city, controlled by IS since June 2014, has been reduced to rubble. The mission is now regarded as the single largest urban battle since World War II. 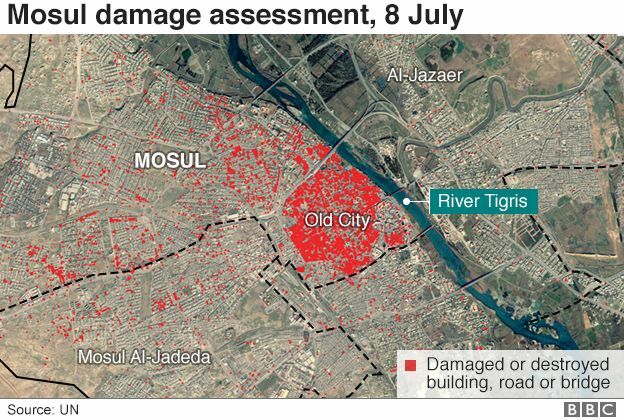 All parts of Mosul have experienced some kind of damage, according to the latest UN assessment. The western half of the city, retaken in July, has suffered more than in the east - won back from IS six months earlier. More than half of Mosul's 54 western residential districts have been significantly affected. The UN describes 15 as “heavily damaged,” meaning most buildings are uninhabitable. A further 23 districts are “moderately damaged,” meaning up to half of the buildings have been destroyed or are structurally unsound, and 16 districts are “lightly damaged”. While UN satellite analysis suggests about 10,000 buildings have been severely damaged or completely destroyed, the real level of destruction is believed to be higher. Taking into account damage to multiple floors of buildings, not seen via satellites, the UN now estimates the real number of damaged buildings to be more than three times greater - about 32,000. Lise Grande, the UN’s humanitarian coordinator for Iraq, says it will take years for affected areas to return to normal. Reconstructing the city and returning civilians to their homes will be "extremely challenging", she has warned, costing an estimated $1bn (£760m).